Sometimes you need to email someone but you don’t have their email address. Sure, you could go about tweeting at them, or DMing them, or messaging them on LinkedIn for it, but doesn’t that seem a bit counter-intuitive? If you have them there, then why not go ahead and ask your question there? If your question needs to go via email, then there are a few great ways to find it for free and quickly. These are my email finding ninja skills that I am sharing with you. I built links professionally for a few years and learned how to find them manually first. Now tools have replaced a lot of that work, but it can still be a fun challenge. Ready to find their email addresses? Here you go. 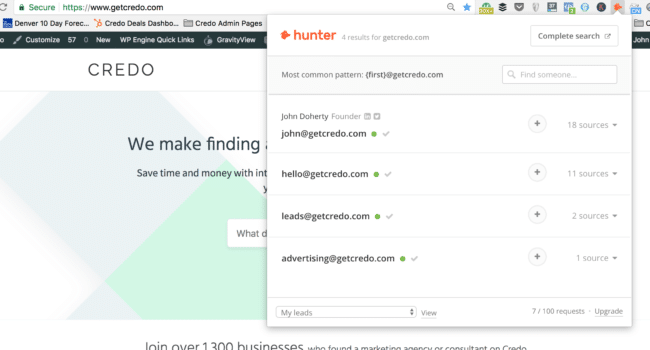 Hunter.io is the best tool on the market for finding someone’s email address. Hunter’s tag line is “Connect with anyone”. 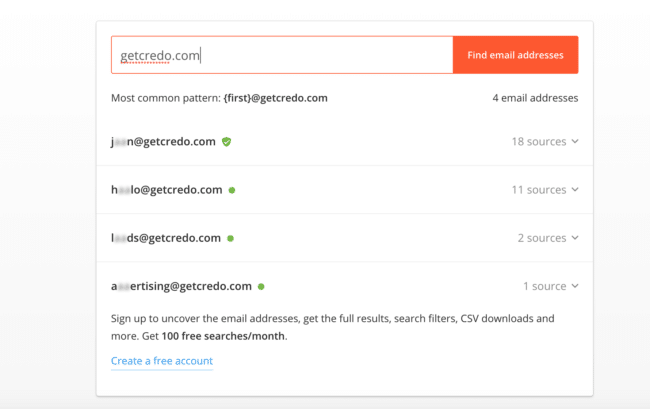 It is a free tool (up to 100 searches a month) that you can use to plug in a domain and receive back a list of emails. If you don’t sign up, you’ll get results back that are slightly redacted. If you do sign up, then you receive them unredacted. But the ninja way to do this quicker is to install their Chrome extension. With the extension installed, you can visit a website and click the extension to see the email addresses they have found associated with that domain. Here’s mine, for example. Let’s see who else we can find. They’re not perfect. 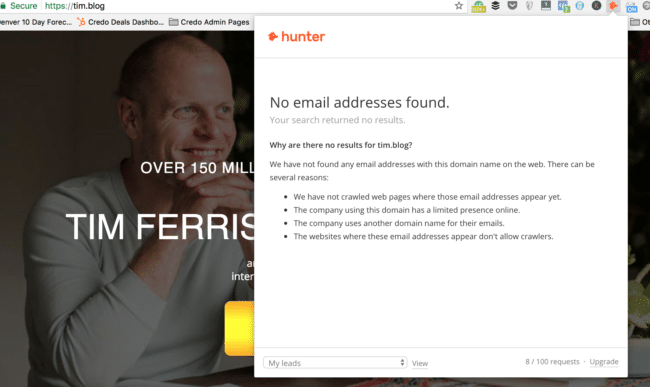 For example you can’t find Tim Ferriss’s from his new tim.blog domain (though you can find it another way). If Hunter doesn’t get you what you need, then you can resort to good old Gmail. Google has actually done an amazing job of associating Google+ profile photos with email addresses, so when you hit the right one you can be pretty sure that it’s correct. 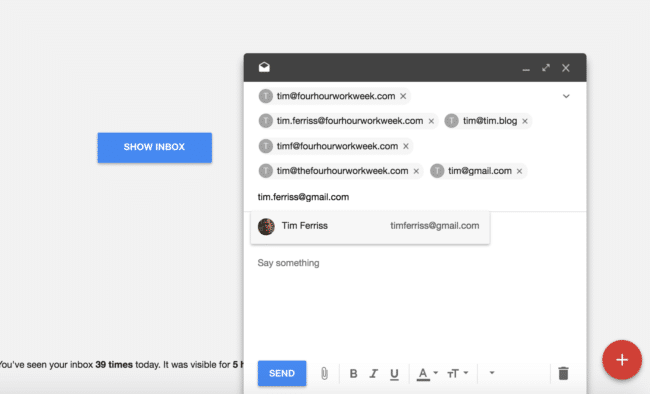 This is relatively easy to do when you already know one person’s email at a company (it’s much harder to do if they don’t have a professional email and instead use Gmail). With Tim, I’ve thus struck out. If you strike out there, then you need to get a bit more imaginative. Lucky for us, most people are not super imaginative with their emails and social media handles. Now please don’t go emailing Tim just because you found his email here (if you’ve read The Four Hour Work Week you know an assistant manages it. I’ve emailed with her multiple times. She’s very nice), but now you know my strategy for finding someone’s email just using Gmail. Sometimes people will put their email address on their Facebook page within their About section. Crazy, right? Not necessarily. These are often public figures who love to hear from their audience and do their best to help everyone they can. If they’re a very popular public figure, then they probably have a (very) private personal Facebook account and a public figure Facebook account. And you may be able to find their email! If for some reason you’ve struck out with the above, you get to resort to good old Google. It’s been a long time since anyone has talked about advanced search operators, so let me show you how I use them. Hmm, nothing yet. But finding the email from this is not that hard now especially since Google has expanded the number of characters in meta description (from 160 to 320) and they also are more frequently replacing standard meta descriptions with content pulled from the page that they think is more relevant to your query. 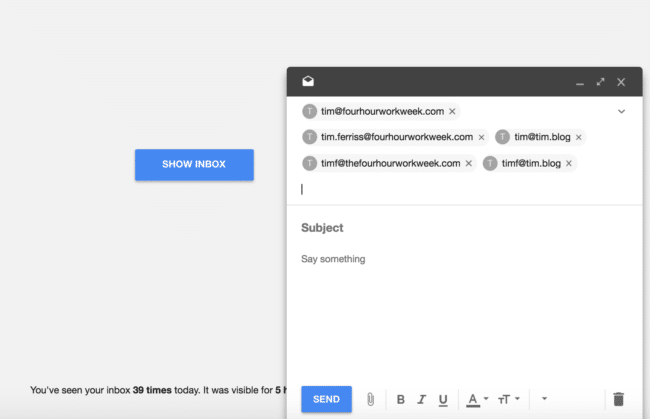 Really, they’re making your email hunting easier. I can almost guarantee that one of these will pull it up for you. Like, I’m 99% sure this will find you their email especially if it is a business email. If you cannot find their business email and you suspect they are using a Gmail for it, then swap out the third part of your query (@domain.com) and simply do @gmail.com. Then instead of searching @domain.com and the two other combinations above, do gmail.com instead of domain.com. Should you use personal information like this? Some people worry about the legality of using personal information such as an email address for business purposes. This is a valid (and empathetic) concern, but not one that you need to be concerned about as long as you stay within a few parameters. There is a set of laws known as CAN-SPAM, which sets the rules for commercial email practices. In a nutshell, it is illegal for you to add someone to your commercial emails without their permission. 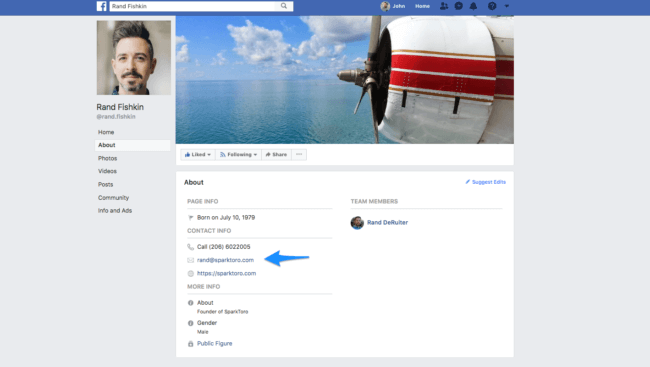 Many email providers, such as MailChimp or Drip, will shut down your account when they begin to receive notices that people are opting out because they were never added to the list. Emailing someone personally when you have gathered their information is not a direct violation of CAN-SPAM and should not be shied away from, but do not add lists of emails to your mailing lists without their permission. As mentioned, emailing someone who you have not previously contacted with a direct email is not spam. People receive email all the time from new people, and it is generally accepted that this is ok. If they don’t want you emailing them, they’ll either respond as such or ignore your email. Now, if someone is responding that they don’t want your email then you should have emailed them in the first place. People tend to respond well to personal and well crafted thoughtful emails that are genuinely useful or have a genuine ask. If people are responding calling you a spammer, then maybe you should wonder if you are. Since bulk emailing people with commercial emails is illegal, are you constrained then in being able to market to them? Absolutely not. There are many ways to use the email addresses you have gathered to market to people directly, and if you’re smart about it then you can also build larger groups of people who have similar profile attributes to the email list and market to them as well. 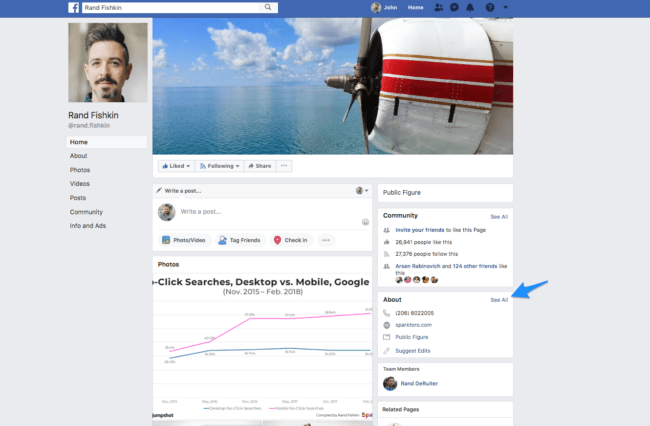 The best way to do this is to use the list that you have built yourself and then upload it to the myriad of social and advertising platforms that allow this. Has this post been helpful for you? What email can you not find? I’d love to help out and learn with you! nice tips you’ve got there and, I should add, there are many more! Another advice I’d add to your suggestions is to look at Twitter: lots of people share their email address there.